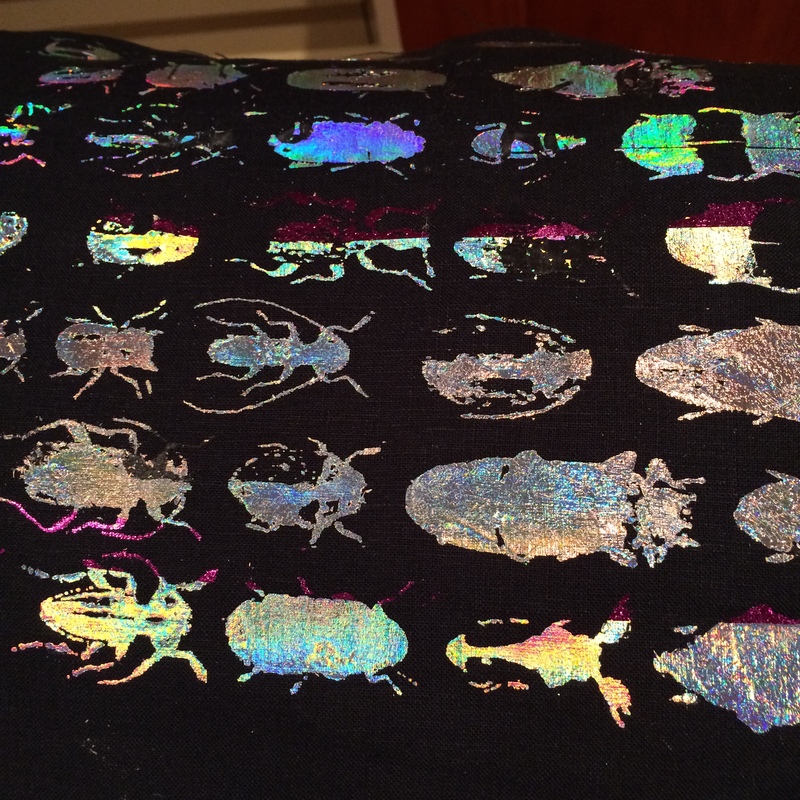 Hand printed fabric – with shiny beetles! I have already blogged about the top I made in this fabric. This post explains how I printed the cloth. But first a word about beetles. My Mother and Jenny had an “uggh” reaction to the beetles, which is understandable as some beetles can bite and harm you (malaria, dengue fever), many are regarded as pests (locusts) and large flying ones can be frightening. But me, I really like insects and find them fascinating. Like humans they can live in all parts of the planet. They can walk, fly and swim. Bees make honey and pollinate, and silk worms make silk, ladybirds and butterflies are pretty too. Some of them – like ants and bees – have advanced social behaviour and create staggeringly beautiful and extensive living areas. These guys can metamorphisise – let’s hear it for the insects! In addition, of course, they have a nasty side too. The dung beetle, the death watch beetle, the woodlice scurrying in the undergrowth, the creatures that live off the dead. So I suppose some of the fascination is fascination with death, decay, and fear. The Mexicans celebrate the dead through incorporating skulls made of sugar, or embroidery, into their everyday lives; and of course designers and artists like Alexander McQueen and Damian Hirst have adopted skulls in their work. Putting the scary into art helps us deal with it – everything good has a bad side, life is meaningless without the inevitability of death, beetles are just part of nature, as important as the pretty butterfly. So the idea that middle-aged women can adorn themselves with delicate flowers and colourful butterflies but should steer clear of the stag beetle or praying mantis, is one I am trying to challenge. 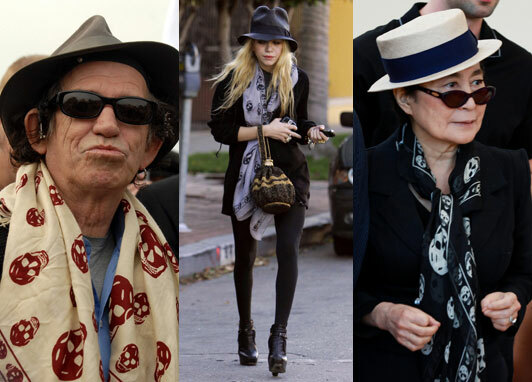 Having said that ancient rockers like Keith and Yoko do look a bit predictable in their rakish hat/sunglasses/AMc scarf get-ups. 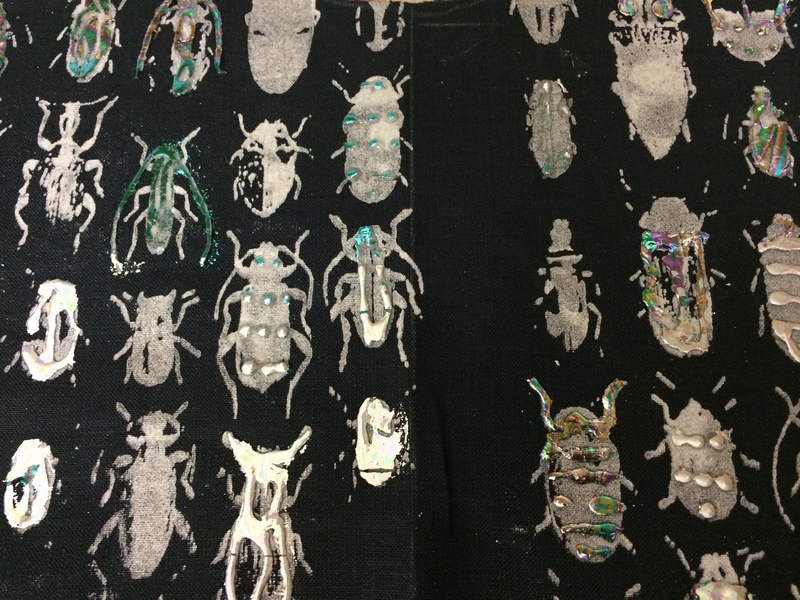 I took a piece of firm, dark grey-blue linen and printed it with my beetles screen, using bright white printing ink, binder and added silver pigment. I created whitish, silvery beetles. As I blotted off the excess quite a lot of the whiteness came away and I was left with a subtle, silvery print. It was a nice effect. However I was keen to do something more blingy. Many beetles are shiny in their natural state, and I wanted to capture this. This photograph comes from The Sun, with its hilarious headline. So I tried using foils. We have two approaches which work well. My first sample used plain (unprinted) grey linen. This effect involves screen printing your plain fabric with textile adhesive, and leaving it to dry. Then using the foils in the heat press you get this effect. I used a silvery foil, with just a couple of strips of pink. As you can see the effect is quite flat – this is achieved by adhesive with foil. It is a nice effect and pretty close to the commercial T-shirts printed in this way. It is washable (like all the effects shown here) at 40 degrees C. The iridescent colours are an effect of choosing a silver foil with this kind of finish. However I wanted something more crafty. We had a second kind of glue that can be piped or painted onto the fabric. I used this on top of my previously screen printed beetle fabric. As you can see I cut out a bodice piece and tailor tacked the darts, so that I could see where I was applying the glue. I decided only to use the foils on the top two blocks of printing, around the bib of the blouse rather than across the whole piece. It was fun applying the glue, which is then dried using a hair dryer. The second stage is to use foils on top of the glue. These are heated, again with a hair dryer, until the foil sticks to the glue and comes away from its backing. I used the irredescent silver again, combining it with turquoise and a swirly pattern which included turquoise, purple and silver. In the picture below they have been heat dried and rubbed with a tissue to ensure the foil sticks to the glue effectively. Here is the effect on my blouse. It is quite striking and I found that blobs and dots created very interesting texture and I really loved the effect. The blouse pattern is the shell top from my SWAP suit Simplicity 7305. It is basically a sleeveless bodice with a zip up the back. The shell top was trying to be a T shirt before T shirts were invented. I like them and feel they go well with a 1960s suit. They are often referred to as an “overblouse” implying they would not be tucked in. Therefore they are fairly short and sit over the waist band of the skirt. 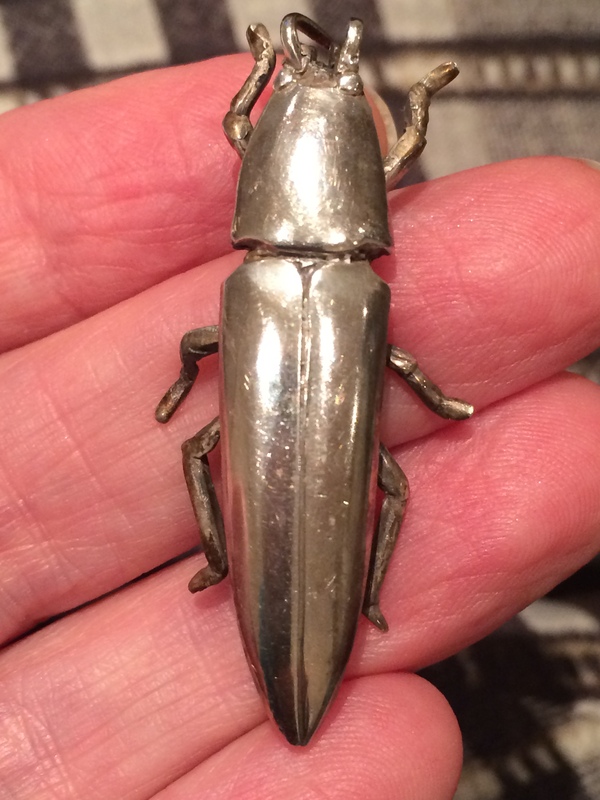 And on the subject of beetles, I bought a brooch in Havelock North, New Zealand, made by Auckland based jeweller Tania Patterson. I loved it so much that I contacted her from England and asked her to make me the whole set of six insect brooches, which I wear all the time. This little fellow is a bit battered and may need a clean, but you can see my love affair with beetles contnues. A comment from Kbenco had me searching for images of Christmas beetles. I think this is from a display at the Australian museum. Fascinating but I still had to scroll quickly past the beetles. 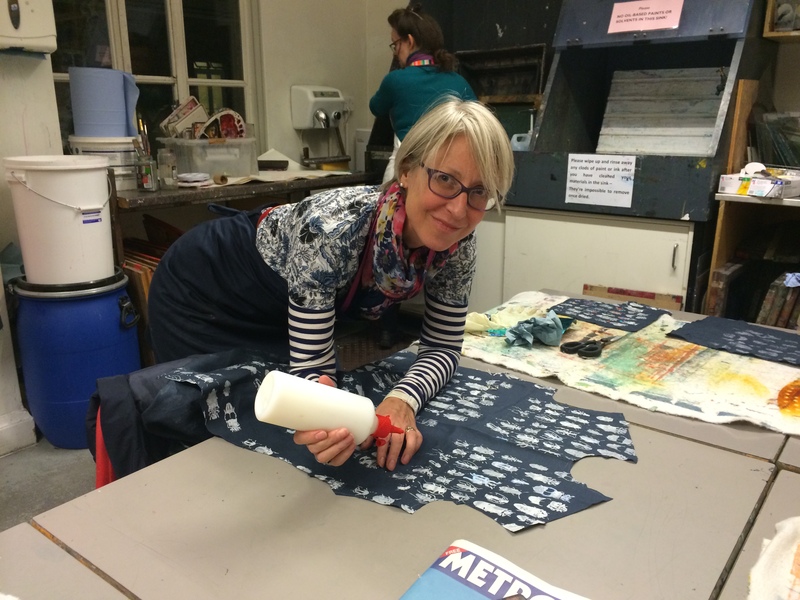 I would love to do some fabric painting/printing but where I live “in the sticks” there is a dearth of interesting courses. I did attend a bra making workshop a couple of weeks ago even though I still had to travel 60 miles even deeper into the countryside but it was so worth it. A whole new side to sewing has opened up to me. I guess because I grew up near to my uncle the entomologist, I also learned that insects are fascinating and beautiful. Visiting my uncle this spring he was surprised to see me reading at length the giant book he wrote about flies. 🙂 Your beetles definitely fall into that category. The only time I have been slightly bothered by insects is when I lived in Australia and there was a huge crack under the door of my little cottage. I would wake up with big spiders on the walls! The Christmas beetles are amazing. Great job, Kate. Interesting point, too about death and culture. I have never thought of it that way before. The metallic foils look very cool – and I like your Tania Patterson brooch (I hadn’t heard of her until now). I’d like the idea of combining the beetle print with the beetle brooch if that’s what you might do. 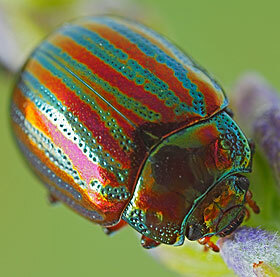 Also, that ‘foreign’ blue/green and red striped beetle is very beautiful, even if destructive. I wonder where it originates from? 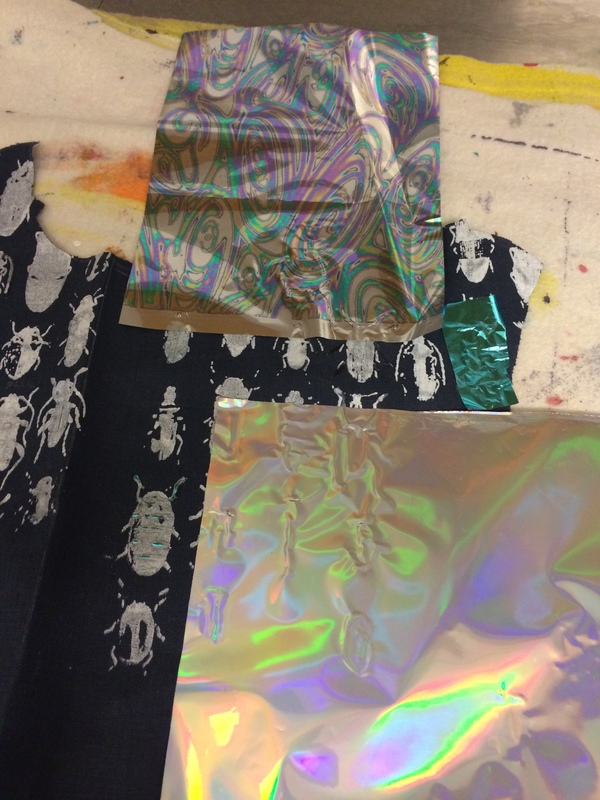 Stunning stunning fabric – hope the insect series continues for a long time. I would love to see praying mantis fabric! Thank you for sharing your creativity. Your fabric is just getting better and better! 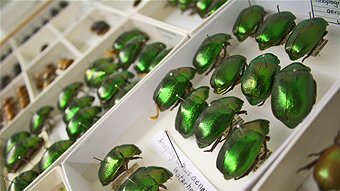 We used to have green shiny beetles that visited our fruit trees at the end of summer. Once I saw a display of beetles used as beads in a vintage show from Lesage in Los Angeles back in the 80’s…it was breathtaking! Thank you Mrs Mole. I did read something about “beetle wing embroidery” on the internet, and this link is interesting. There are lots of interesting images, and I did think of buying the wings to incorporate (apparently they are very robust, with a tiny drill hole, but perhaps not ideal for dropping in the washing machine). What kind of foil did you use? Here in holland nobody can help me and I would really like to try it myself!! I’d really appreciate it if you can help me!! I had a look on line ydep, and I think the thin stuff is called textile foils. I think the stiff ones are used with a heat press, and the light flimsy one can be fixed with a hairdryer as well as a heat press. I guess you could buy from the UK if it is not available in Holland. Look at screen printing sites.